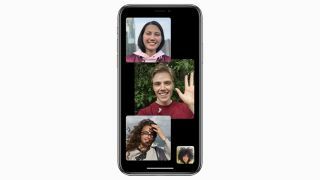 If you're eagerly waiting to start some group video chat conversations with your friends over FaceTime, you'll be pleased to know the feature is finally reaching Apple-made devices with the launch of iOS 12.1, which should be any day now. The newly updated iPhone User Guide for iOS 12.1, available through Apple Books, mentions posted by Apple mentions the new feature, as well as support for dual SIM access in the 2018 models – the iPhone XS, iPhone XS Max, and iPhone XR (the last of which just went on sale on Friday). However, not all the devices that get iOS 12.1 will get Group FaceTime – as 9to5Mac notes, the iPad mini 2, iPad mini 3, iPad Air won't get the feature, and group calls will be limited to audio-only on the iPhone 5S, iPhone 6, and iPhone 6 Plus. It sounds as though the older models just don't have the hardware grunt to be able to support up to 32 people video chatting on the same call, so bad luck if you're using Apple devices that are a few years old – you'll have to wait for a device upgrade. Meanwhile dual SIM support on the newer iPhones will enable you to manage two numbers rather smartly on the same device, with apps like FaceTime and Messages separating out calls and texts depending on the number they're going to. It uses a special virtual eSIM rather than a second physical SIM card (check your carrier for details). We don't know exactly when iOS 12.1 is going to hit, but right after Apple's event on Tuesday seems like a sensible bet. The company is expected to unveil another bundle of devices, including new iPad Pros and MacBook models.